How old is that tree? Trees, particularly big trees, are fascinating, and one often wants to know how long a tree has been alive. Was it here when Lewis and Clark reached the Pacific Ocean in 1805, or when Oregon became a state in 1859? Did it survive the Columbus Day storm of 1962? Did it germinate and begin its life as a result of the Tillamook Burns or the 1996 floods in the Willamette Valley? Although we love to ask the question, it is usually nearly impossible to guess the right answer, especially for big trees. Tree size is as much a reflection of tree species and growing conditions as it is tree age. Consider a California redwood (Sequoia sempervirens). This fast-growing species can easily reach 40 feet in ten years. On the other hand, it may take a lodgepole pine (Pinus contorta) twice as many years to reach the same height (Burns and Honkala 1990). Nearly any conifer species growing in the sun will grow significantly faster than it will in heavy shade (Figure 4.1). Grand fir (Abies grandis) or Douglas-fir growing in the moist, moderate climate of western Oregon will grow taller faster than it will in the drier and colder climate east of the Cascades. Ultimately, knowledge of species, habitat, available tools and techniques all help in estimating tree age. Figure 4.1. 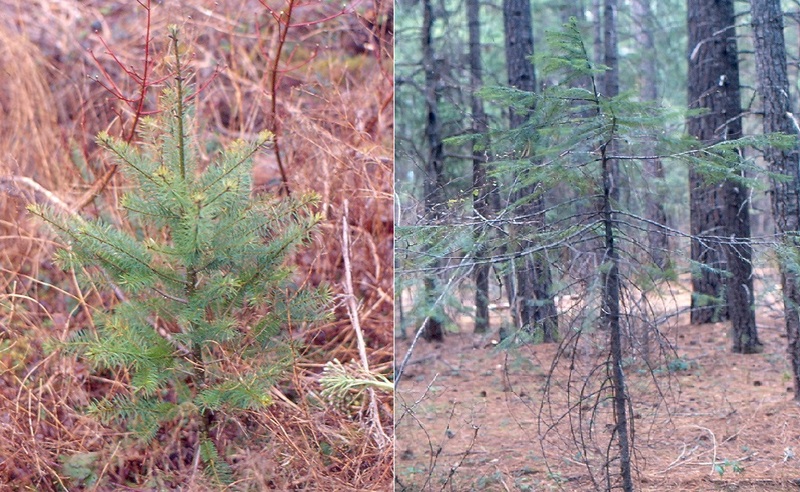 Douglas-fir seedlings growing in the sun (left) and shade (right). Note the bushier appearance and greater number of needles on the tree in the sun.